Very quiet, confidential - all inclusive, bikes, tennis table..
More than 75 very appreciative reviews, thank you to all our charming hosts who shared the pleasure of staying in our house dedicated to seasonal rental, and that we wanted to be like "home away from home" by its decoration and its comfort. Located 600m away from the Saint-Remy-de-Provence town centre, this single-storey villa is located in a peaceful residential district. This house has many advantages: it is close to the town centre, it has leisure equipment such as a heated private swimming pool, a petanque court, a tennis table, bikes availabe, free Wi-Fi connexion, satellite TV and a film library. About 10 min away by walking from the Saint-Remy-de-Provence town centre, 20 min drive away from Avignon TGV and 50 min away from the Marseille International Airport. The single-storey house includes 140sq.m of living space, a beautiful lounge with comfortable space, a contemporary and cosy decoration, opened to the inner dining room. It also includes an well equipped kitchen. The main bedroom leading to the pool is equipped with a 180 cm bed and shares its separate bathroom (basin and bath) with a second bedroom that can be adjusted depending on the choice into a double bedroom with a 180 cm bed or two 2 x 90 cm beds and separate toilet. The third one is also a bedroom with a 180cm large bed that could be turn into a twins 2x90cm with an en-suite shower room, toilet and basin. You will find a laundry with washing machine and dryer. The studio has a renovated (2015) air conditionned separate bedroom with king size bed 180cm that could be split into twins bed, a shower room with basin and toilet. Shaded Terrace with light, table and chairs. You will find a 1000sq.m garden with trees, heated private swimming pool, and surrounded by Mediterranean essences. You will have a summer dining room under the pergola shaded by a wisteria as well as a gaz plancha/barbecue. Safety and equipment include: television, DVD player, stereo system with I-pod stand, CD player, high speed Wi-Fi/internet connection, satellite TV and bikes are available. You will find a tennis table. It includes an electric gate, a car park for three cars, an alarm, a petanque court and air-conditioning in the main room and the main bedroom as well as in the independent studio. The pool is secured for children by a fence. La maison de Pegomas is ideally situated to profit from all the very best Provence has to offer. Located just ten minutes walk from the beautiful St. Rémy-de-Provence and within half an hour’s reach of the towns of Avignon, Arles, and L’isle sur-la-Sorgue, to name but a few. There is a wealth of cultural and historical attractions within an easy drive. In Arles, you can see the Roman ruins, the Museum of Arles and Provence or go to the lively Saturday market. In Avignon, there is the Palais des Papes, an important medieval gothic building, boasting one of the largest gothic fortresses in Europe. You can take a leisurely boat ride on the canals that pass through L’isle sur-la-Sorgue, a small but vibrant town, particularly visited for its many antique shops and where you can see working water wheels throughout. Leisure activities around the area include horseback riding tours in Egalières, or avid golfers can tee off from either the Servants, Pont Royal or Manville courses nearby. For those feeling more adventurous, hire a bike for the day and choose a challenging long distance mountain bike trail. Whether an easy or vigorous route, cycling is one of the best ways to experience the breath-taking vistas of the Provencal countryside. Airports: Maison de Pegomas is 45 minutes from Marseille Airport and 1 hour from Nimes Airport. If travelling from the UK, British Airways fly from Heathrow-Marseille, EasyJet fly from Gatwick-Marseille and RyanAir fly from Stansted-Marseille and Luton-Nimes. Train Station: Maison de Pegomas is 20 minutes from Avignon TGV. During May – September there is a direct train from London St Pancras to Avignon with a journey time of 6 hours. Please check the Eurostar website for schedule as it is not a daily service. Hello ! My wife Lucie and I, are the happy owner of this great villa where we spend only a very few time each year. We are living and working in Saint Rémy, Lucie as a web marketing advisor, and me as a real estate agent specialized in seasonal rental, that is why we are taking great care of our guests ! We are very aware of suggestions to keep offering the best experience ! Saint Rémy de Provence is THE village of the Alpilles area. Of course, others are beautiful also, and you have to visit them, but St Rémy is the most popular with lots of restaurants and shops, and even a great authentic and provencal atmosphere, little village places full of charm, and still quiet (except during wednesday morning as it is a famous and very well known provencal market). Saint Rémy is also ideal as a basis to visit Provence, close by the TGV train station of Avignon (20 minutes) that offer direct line to Paris in 2H30, St rémy ios also 45 minutes from Marseille international airport. The great points : Before offering this villa for rent, we used to live in for about a complete year, and we have experienced this very quiet surrounding, while it is very close to town. We love its garden plenty of charm and we maintain it at its best level. There is a cherry tree plenty of fruits during May-begining of June, an abricot tree for July, and a figue tree for September, as well as a vigne in September/October also ! The house is very well built with a perfect thermal insulation (double insulated walls, 30cm of glass wool over head, double glazed windows..) so we do not suffer at all from warmth. Also, there is an air conditioning system in the living room and the master bedroom for the warmest days . We do improve the house and its equipments all year long, and pay great attention to its maintenance. Everything is working well. May be suitable for the wheelchairs (single-storey) Cleaning made twice a week for two hours is included. The villa is very pleasantly situated being in a quiet residential area around ten minutes walk from the town centre. It is a spacious bungalow with three bedrooms in the main building and one bedroom with modern ensuite in the garden area. The large master bedroom which opens onto the pool area does not have an ensuite but is next door to the family bathroom and separate toilet which is a little dated. The smaller front bedroom does have an ensuite and the third bedroom opens onto the pool area. There is air conditioning in the master bedroom, garden bedroom and lounge. There are full sized quiet fans in the other bedrooms. We had a mixture of family and friends stay during our fortnight and they all thought it well furnished and more than fully equipped with a delightful garden and heated pool. It is possible to park three cars in the securely gated driveway. We were made very welcome by Jenelle who visited twice weekly to clean the villa for two hours. She also gave us lots of ideas for sightseeing, eating and local events. Julien came promptly to mend an appliance that had broken and while he was there organised the television to show the World Cup matches! We would definitely recommend a holiday here and I am sure that anyone would feel well looked after. Always glad to hear such nice review. After reading your comment, I have planned the works to update the toilet this coming winter 2018. It is in perfect condition but I share your point of view, the style is little dated. Our family of seven just spent eleven nights at this property, and everything was perfect. It is about a ten-minute walk to the charming town. The heated pool was great for kids. The hosts provided bikes, and everything in the house was in working order. One of the bedrooms (with bath) is in a separate little cottage, which would be ideal for in-laws or older teens. Secure, quiet location. Ideal vacation spot for families. Our family enjoyed a week at this beautiful and comfortable home. We were six people from 4 generations, from my 85 year old mother to my 24 year old granddaughter, and it was perfect for all of us. My son and daughter-in-law were in the master bedroom and my granddaughter in the second bedroom all overlooking the pool and beautiful backyard. My mother was in the third bedroom and had her own private bath. All these rooms have amble closets and storage and very comfortable bedding with quality linens. My husband and I stayed in the studio and loved the privacy and coziness. Outside the french doors is a lovely arbor covered in yellow roses. The grounds are beautifully kept. Julien arranged a local chef for us, Nadege, who prepared a delicious meal for us one night in the house. She was a delight! The laundry room is large and efficient with racks for drying items that couldn't be put in the dryer. The kitchen is well equipped. It was a very easy walk into town which saved on the hassle of parking. There are many very good restaurants and shops in the charming town of Saint Remy, and it's the perfect location from which to venture. 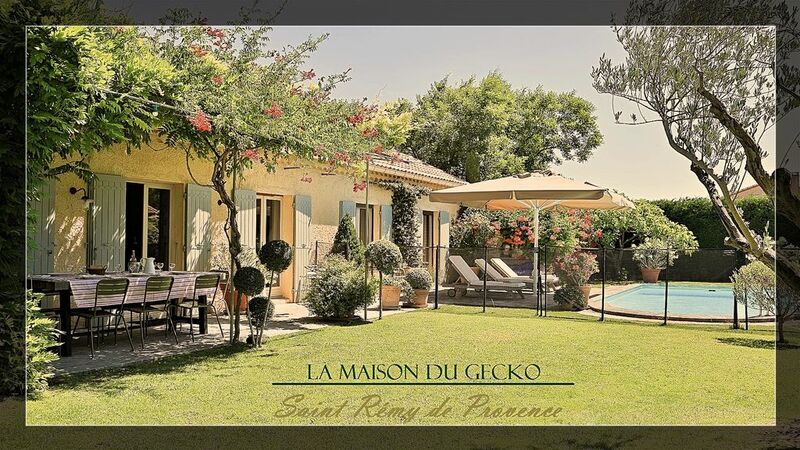 We highly recommend La Maison Du Gecko and hope to be able to return! We had a very enjoyable holiday in St Remy. Unfortunately, the weather was rather cool and rainy but it was so nice to return to such a warm, comfortable and spacious house after a day out. The heated pool was a great bonus. The house is very well placed for a stroll into St Remy or to explore the surrounding towns and villages and Jenelle's help and advice on local restaurants and places of interest was much appreciated. Thank you! Lovely Alpilles renting in Saint-Remy-de-Provence, close to Maussane-les-Alpilles, Baux-de-Provence, Eygalieres, Avignon (15 min away), Arles (30 min away), Marseille, Aix-en-Provence and Montpellier (1h away). Horseback riding in the Camargue, festival of Avignon Theatre, lyric art in Orange, classic music of Aix-en-Provence, contemporary art in the Alpilles, etc. You will find many star restaurants in the area as well as numerous renowned 9 and 18 hole courses.